Avalon Game Company have posted a free preview of their Leviathans Victorian Sci-fi tabletop rules. 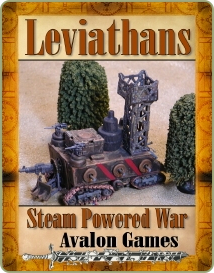 From their website: Leviathan offers a simple to play set of rules for the construction and engagement of steam-powered war machines and the infantry which support them. Based loosely on the Victorian steam punk genre, the system is designed to allow players a flexible system for building and setting up battles for these forces. The game is designed to allow players to kit bash whatever sort of Steam Tank they want, allowing their imaginations to run free and their modeling skills to really take hold. Fully designed to allow players to use whatever figures and miniatures they have on hand, the system is meant to allow players all the freedom they need, while giving them simple to follow guidelines and a system for waging steam-powered war. Provided in this sample edition of Leviathans is a simple set of rules for you to play around with the game. It is not intended to be a full game, but only a sample of the system. To buy the full game, go to any one of the many sites we sell our games on and purchase and any of our other great games.